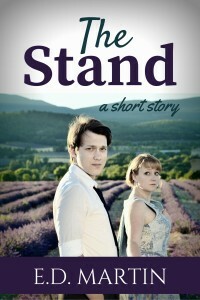 This month’s excerpts are from the next stand-alone short story I plan to release, “The Stand,” about an American guy’s up-and-down relationship with a mildly crazy French girl. I hope to have it ready to go in the next couple weeks. In this week’s scene, Daniel is looking back at his relationship with Mireille. Mireille denied everything—her looks, her brains, her talents—while claiming all her faults. At this point she was at his apartment several nights a week, although often for only a few hours; she crawled into bed with him after he was asleep, and often left before he was awake. Sometimes he’d wake to find her curled into a ball beside him, her features so relaxed and beautiful that he’d spend an hour just watching her in the mottled sunlight streaming in from the unshuttered bedroom window, loathe to disturb her, and they’d both end up late for work. And other times, like that night, she’d slide in next to him and wake him up, to talk about whatever was keeping her from sleeping at her own place, and after he’d calmed her down, reassured her, answered her questions, she’d slip out again. He was never sure which he’d get with Mireille. Sounds like Mireille is dealing with a lot of issues. I hope Daniel is able to help her work through them. She sounds complicated, but you made it clear that the calm moments with her are beautiful and serene for Daniel. Great snippet! She’d be quite the energy-deanding person to have as a friend but apparently her more peaceful frame of mind really makes him happy and willing to hang in there as her lover. Interesting snippet! A very complex, complicated relationship. She sounds like she has a lot of issues that somehow just make her more interesting. Great snippet. I love the beautiful dysfunction of this! It’s like that poetry that flows over you, stunningly beautiful and barely comprehensible. Nicely done! Wow. Gotta be interested in a fictional character who wonders if she’s real. Her existential angst seems very Gallic. She seems deeply troubled. That might make her interesting to be around, but in the end, I don’t see this being a stable relationship.